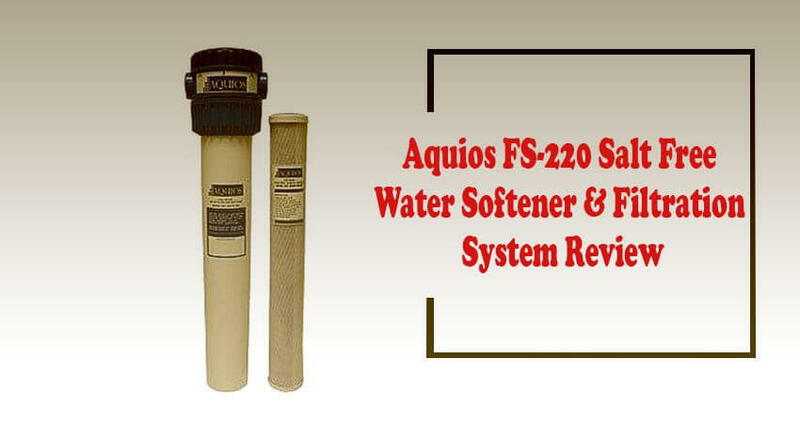 The Aquios FS-220 is a salt-free water conditioner system that filters water as well. It only “conditions” your H20; it does not remove the calcium and magnesium that harden the water. But the FS-220 does get rid of the negatives of hard water. And since you retain the calcium and magnesium, you continue to get their benefits in your drinking water and food preparation. It’s for an entire house. Hence, it’s termed a whole house system. The Aquios AQFS220C Full House Water Softener and Filter System is the exact same product as the Aquios Salt-Free Water Softener, the 220, reviewed here with it. The only difference is that the 220C comes in a clear housing while the 220 comes in white. The size, price, and functions are the same. The hard minerals—the calcium and magnesium are merely changed into crystals. Beads of polyphosphate siliphos convert the large ions into small crystals such that in the water moving through your household they do not affix to pipe walls and build up. Scale problems are solved! Appliances using your household water are protected, too. Also, deposits of scale get washed away. Stated to be commercial grade quality in its operation. To filter out chlorine and harmful chemicals plus sediment that you don’t want, the Aquinos FS-220 works via a carbon block cartridge. You get conditioning and filtration. The carbon filtration is at a 5-micron level. You end up protecting well your faucets, your pipes, shower heads, hot water heater, washing machine, and other water users in your house. The hard minerals just don’t build up. With conditioning combined with filtering, the taste of water is improved to a very great degree. However, because the hard calcium and magnesium are still present, you likely will not cut down the amount of soap of various kinds that you use. But the slick feel of soap in your water is dealt with. Users do report clear water. And clean dishes clear of spots. The water from the Aquios FS-220 is safe to drink from your tap. As it’s salt-free, it does not add to your sodium content. But purists may still go for distilled water or water specifically sold for pure drinking. 99 percent of chlorine is filtered out. The chlorine taste and smell go away. Rust is reduced plus iron. Sediments are filtered. You get truly changed the water! Water softeners/conditioners come in 3 types: whole house systems, those that filter water only from 1 faucet, and portable ones that are good for RV’s, mobile homes, and boats. The FS-220 is for your entire house. This Aquinos is smaller than its competitors. At 27 x 10 x 8 inches, it’s considered a compact model. And it weighs 10 lbs at 9.3 lbs. You save space. And you save funds by buying a combination system. Very noteworthy is the fact that you will not lose any water pressure. Your water flow remains intact. Also, you do not have to program the Aquinos FS-220 device. Finally, no electricity is required to run it as with salt-based type water softeners. So it’s less expensive. It’s a maintenance-free conditioner/filter. No type of periodic servicing required. Just replace the cartridge. Because it is salt-free, you do not incur the cost of 9 to 10 lbs. of salt per week on average. The excellent in-head valve design resists breaking. A quality component! You do not have to pay a professional plumber to install this one. Some report that the cost of a pro installation job is worth it, though, to have a truly easy installation of this system. A new cartridge runs from $59 to $69. The cartridge will condition and filter 40,000 gallons of H2O. And this equates to six-months of cartridge life. The 220 is available on Amazon for $419 with shipping for free. This price is in the middle of quality whole house water conditioners/softeners. May not solve the problems of exceptionally hard water. Salt-based systems work better in such cases. Very high costs result where high concentrations of sediment are present. Frequent cartridge replacements required for high sediment levels. Is the Aquios Salt-Free considered an environmentally friendly conditioner? Yes, as it does not dump salt-laden wastewater into the city water or ground. Will the 220 and 220C work for medium to large houses? Yes, these conditioners will work for houses up to 3500 square feet with up to 3 full baths. The Aquios company only makes salt free water softeners. Their products do perform quite well. The 220 and 220C do take out 98 percent of chlorine. Iron and rust plus harmful sediments are removed. And the problem of limescale is solved. With such performance backed by the noted 20-year guarantee, I say purchase either model—the 220 or 220C.